A P-38 crashes in flames while other aircraft are visible in the sky amongst shell bursts. A body of water flanked by trees and gun emplacements is visible in the background. 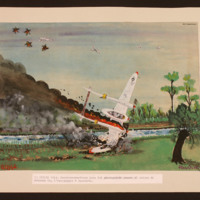 A P-38 crashes in flames near a canal which is bordered by vegetation. 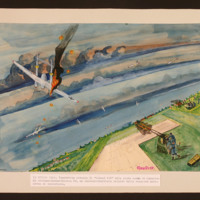 Four other aircraft are visible in the sky amongst bursts of anti-aircraft fire.